Today’s the day! 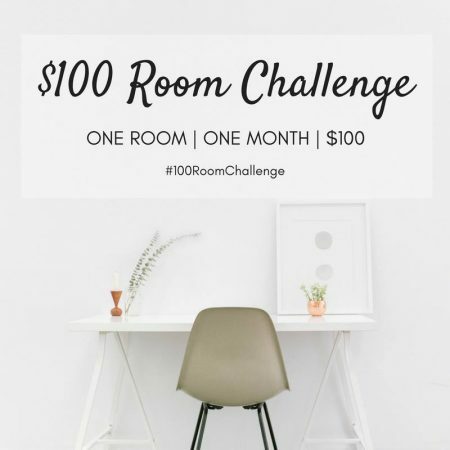 Reveal day for our laundry room makeover of the $100 Room Challenge! I have to say that when Erin at Lemons, Lavender and Laundry invited us to participate, I thought it would be a pretty easy update. And it has been, until today. Reveal day kind of snuck up on me! 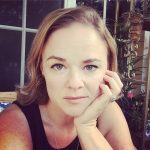 I have been crazy with getting estimates for work to be done on the new house, and forgot completely about this last post – the most important one! – until yesterday afternoon. At that point, I took a bunch of pictures of the room. But when I went to edit the pictures and write the post late last night, I noticed all kinds of things that I missed! For example, painting the supports for the shelves in the closet. And painting the kick plate for the cabinets, and that the baseboards were a mess! Oh, and that I missed all kinds of paint spots on the new litter protector – there were still blue spots, the first color I tried on it. It was too late to fix everything last night, so I got up early this morning and finished all the little tasks in about an hour. I decided to spray paint the litter protector with a gloss so it would be easy to clean, as the chalk paint I tried originally was not easy to wipe clean. So, without further delay, here is our updated laundry room! One of the things we just started with the kids is to have them all do their own laundry. Yep, even the little girls. I just couldn’t keep up with all the laundry, and they are all perfectly capable of doing it. 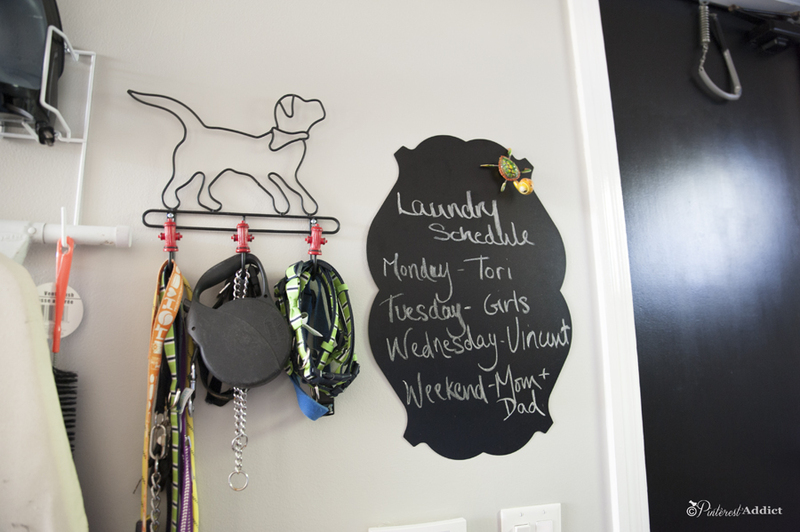 I used this magnetic chalk board from MD Hobby and Craft to keep the schedule. It’s easy to clean and write on. It’s attached to the wall using four 3M Command poster strips. Holds like a charm! I repainted the litter protector, so now it’s all shiny and black. Yeah, I admit, I kind of stink at details sometimes. 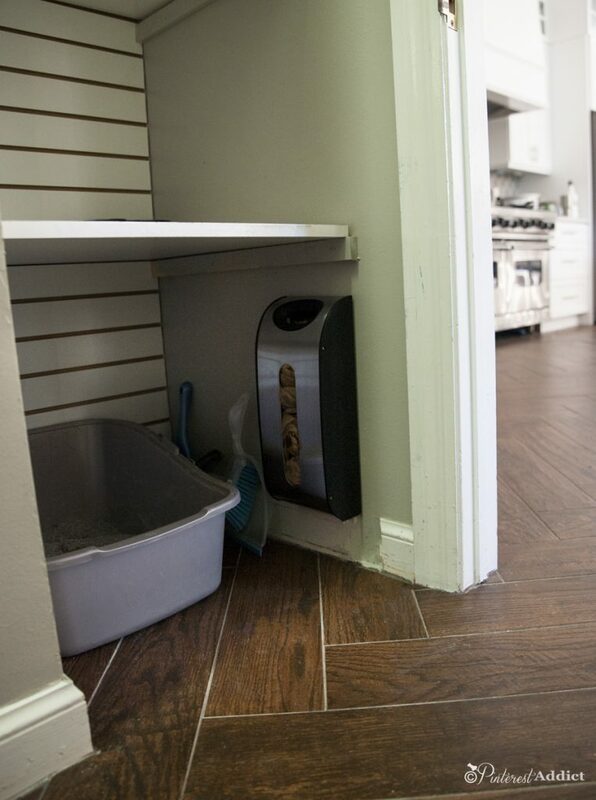 The kitty litter area is set up in the bottom of the former broom closet. We have it set-up with easy access to all the things we need to keep it clean – bag holder, scoops and a mini-broom and dustpan (IKEA). 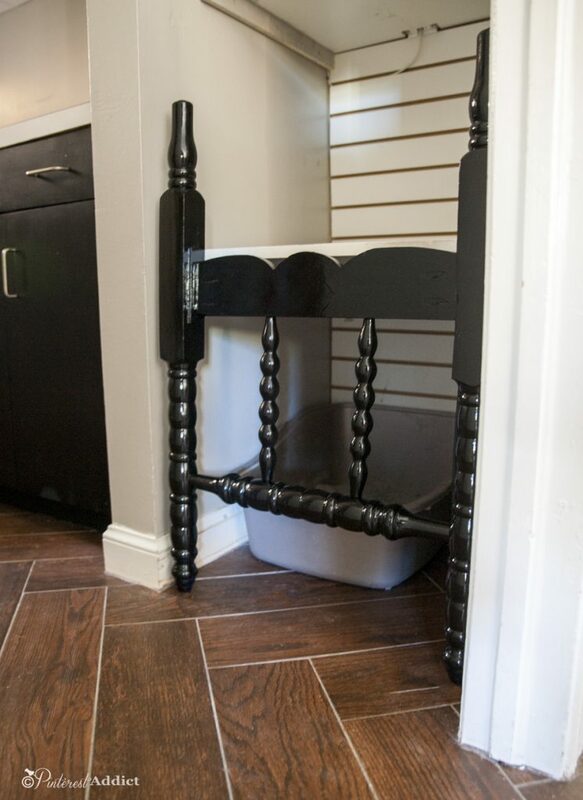 We put their food dish on the shelf above it, which keeps the dogs from being able to reach it. Apparently, dogs aren’t very picky when it comes to what they’ll eat. I think my very favorite part of this makeover is the addition of the flamingos! I used the Flamingo Deco Wall Stencil from Royal Design Studio. I LOVE it! I chose to go with the lightest pink paint I could make out of my stash of chalk paint. It doesn’t look pink at all on the wall, but it really is pink, I swear. I didn’t want to get too crazy with the color choice, since we’ll be putting our house on the market soon. It was my first real experience with using a stencil on the wall, and I have to say it was very easy. I think the use of the chalk paint made it especially so, because it dries so quickly and I could move on the to the next set of flamingos in a few minutes. I think I might be using the same stencil in the new house too. A close second to the flamingos, is the little shelf we were able to add right next to the dryer. We used leftover melamine board from Home Depot and some leftover pieces of wood. The laundry room really didn’t have any space to fold laundry, so I was always folding clothes and making piles on the kitchen counter. It was always a mess, and my towels ended up smelling like whatever I cooked that day. The view is much better from the kitchen, don’t ya think?! So stinking cute!! It looks greenish here… it’s not. It’s painted Mindful Gray by Sherwin Williams. 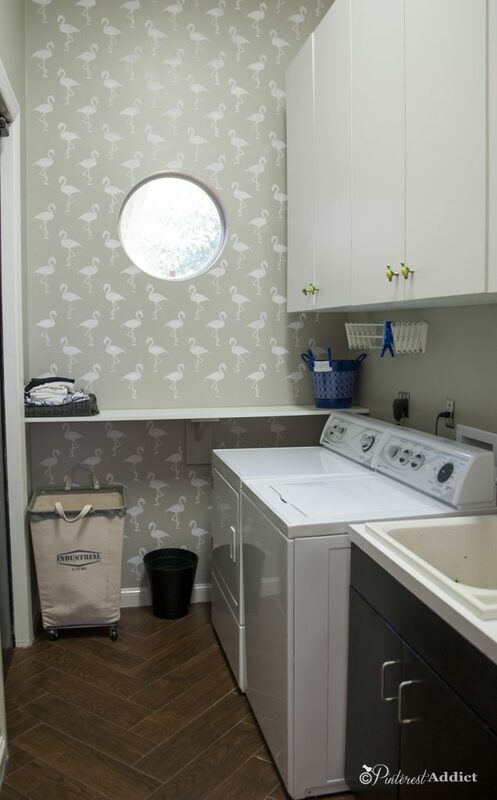 So, that’s it – the laundry room makeover reveal. I’m so glad I joined this challenge. It finally got me motivated to spruce up a space that was in serious need of attention. Go check out the rest of the reveals from my friends. I can’t get over that these rooms were updated with just $100!! Wow it looks amazing! (I feel your pain with not realizing what you missed until you take the pictures. I did mine in two stages so I could fix everything I noticed the first time!) I love those fun flamingoes! 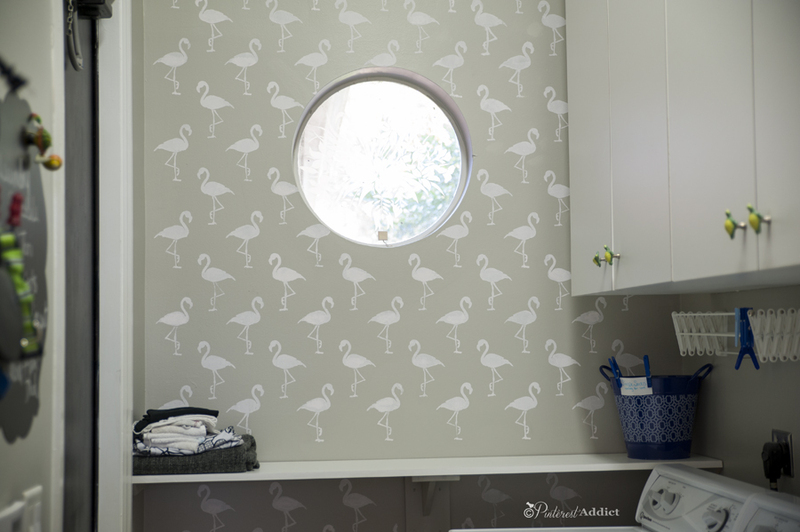 I adore those flamingos and think your new laundry room is stylish and functional. Love it! i love it, eliesa! the flamingos look so great! the perfect touch for you! Boy this challenge is no joke huh? It looks fantastic and good job with the kiddos helping with their laundry!!! Your flamingos are so cool!!! I love the way it all turned out. 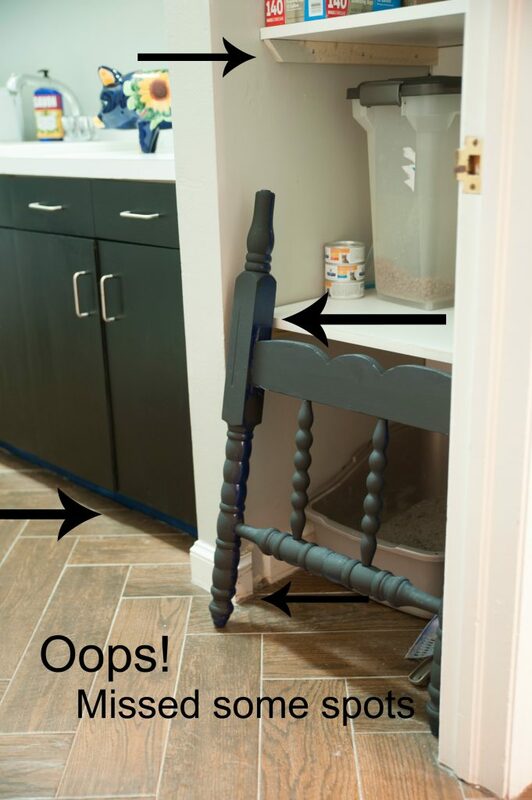 What a great idea for that litter protector! Love this room, it looks so good! The flamingos are my favorite too! Perfect for where you live- I think it will be a selling point when you get it on the market- just that added pop of fun that makes them want “that” house. Great job- it’s gorgeous and super classy! What a cheerful space!! It looks so good. Want to come help me with mine?! The laundry room turned out so great. That flamingo stencil looks like wallpaper. I can’t believe that was the first time you used a stencil. Great job. I’m still loving your cat litter gate. Love the bag collector right there too. You’ve definitely got me thinking about my laundry room. The flamings look great! I thought it was wallpaper. 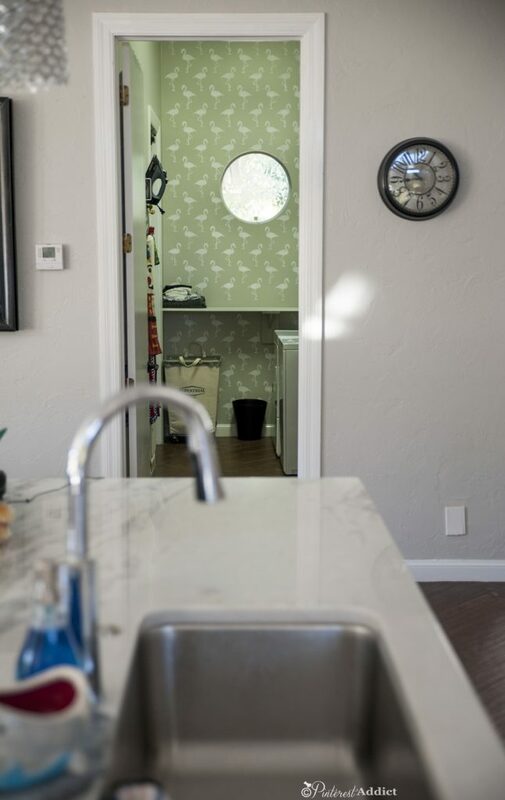 It’s a pleasure to look at it through your kitchen! That flamingo stencil is awesome! I absolutely love it. And adding the folding shelf was a great idea. It has been SO much fun seeing how everyone decided to spend their $100. Thanks for joining the challenge. I think I said it last wee, but I love that herringbone floor! (That is the name of that pattern, right?) And your method of keeping the litter safe from dogs is brilliant. Dogs can be so gross! 🙂 Your laundry room looks great! That is so funny and creative. I have several cats and a dog and I know what you mean. lol. I think that is genius of what you created with the chair. Everything else look so pretty. Love the wall paper. Hello little flamingos (can’t believe their stenciled)!! What a fun spot to do laundry. The floors are gorgeous and the chalk sign is super cute. I still like your creative solution for the kitties! Oh those flamingoes are so neat! Such a great idea! I also love that industrial looking hamper. Nicely done! Definitely thought that was wallpaper and I love it, as well as the added shelf and litter protector. All great adds on storage, design and usability. What is not to love about this room?? The flamingos add such a fun and whimsical touch to the space. I would have sworn that was wallpaper! The entire space came out great! 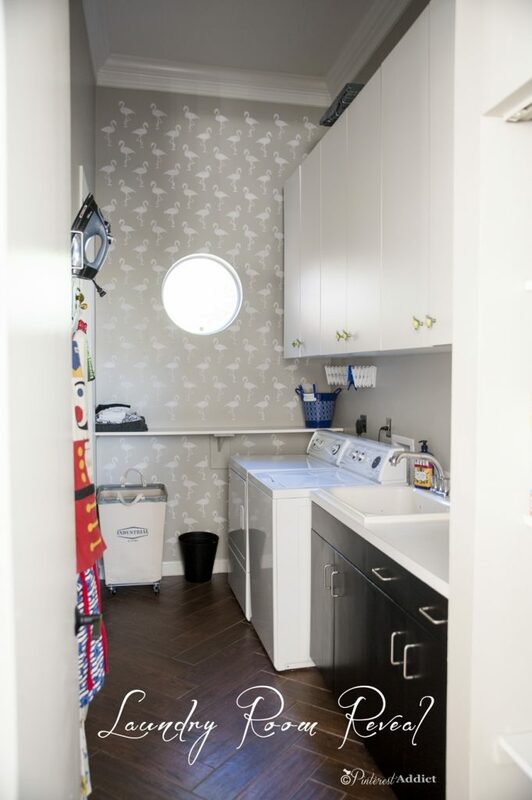 Such a fun laundry room! Love the flamingos! It looks great, and I agree, I love the flamingos! I’m always down for a touch of whimsy and fun! Great job!